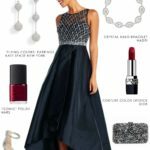 This sophisticated formal outfit features a sparkly long gown for a formal event. This blush and platinum beaded gown with plunge neckline, is paired with platinum accessories. 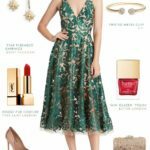 The shopping sources in this sparkly gown post use affiliate links. This site may earn a commission if you make a purchase from our links. 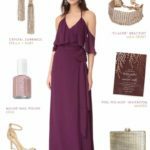 Well, I originally planned this post for last month, when I was inspired by a few sparkling events — the Golden Globes and the season premiere of The Bachelor. 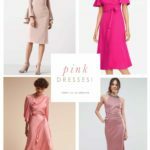 Seeing all of those formal and sparkling dresses in rapid succession always puts me in the mood to create a glamorous collage with an-over-the-top dress. 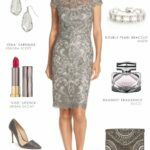 It is still Awards Season with the Oscars coming soon – so here’s a sparkling outfit for formal red carpet event. If you’re not attending any awards celebrations, and you haven’t signed up to be on The Bachelor, this could be a gown for a formal event where a sultry evening gown is in order. It’s even glam enough to be a non-traditional wedding gown. 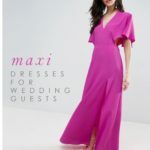 If you’re a bride-to-be thinking of changing into a reception dress, this would be a wonderful look to wear! 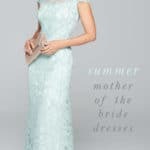 It would also be wonderful as a dress for a vow renewal. One could also to wear this for an Art Deco party or a formal engagement photo session! 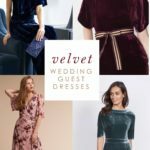 It’s so eye catching, light-colored and daring with that super-plunging neckline, that I can’t recommend it for wedding guests, but some of the other sequin styles in other colors below would work for a wedding guest at a formal wedding. This dress is by Dress the Population – one of my favorite labels for form-fitting sequin styles! Shop more looks below!